Trim prawn feelers and legs and keep the shell on. Mix tamarind juice with seasoning. Add the prawns and toss well. Heat oil and sesame oil in a wok until hot. Stir-fry the aromatic garnish briefly until aromatic. Dish out and set aside. 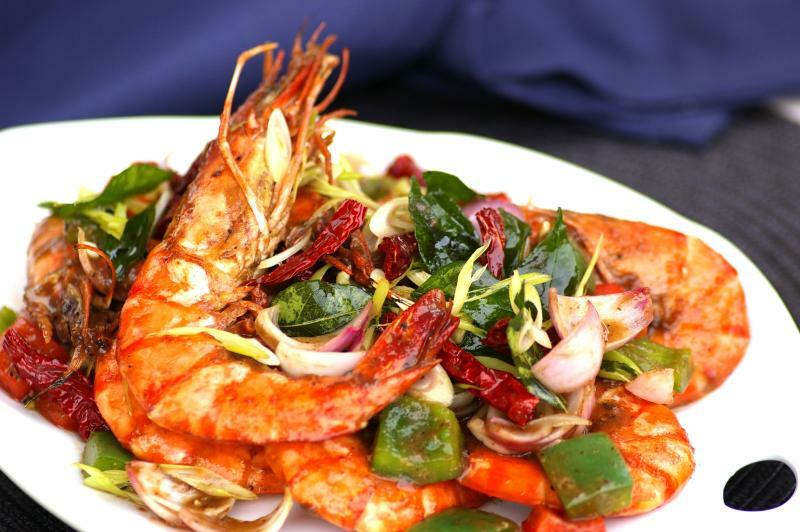 Add a little more oil in the wok and stir-fry the marinated prawns briskly over high heat. Cover the wok, lower heat, and allow the prawns to simmer in the sauce for 2-3 minutes or until the prawns are fairly cooked. Sprinkle in rice wine. Toss and fry briskly until sauce is fairly thick. Add in the prefried aromatic garnish. Mix well and dish out.